Why Is the Historical Buddha Called "Shakyamuni"? Although we often speak of "the Buddha," there are many Buddhas in Buddhism. On top of that, the many Buddhas come with many names and forms and play multiple roles. The word "Buddha" means one who woke up," and in Buddhist doctrine, any such enlightened individual is technically a Buddha. In addition, the word Buddha is often used to mean the principle of Buddha-nature. But of course, there is one historical figure that normally is considered the Buddha. Shakyamuni Buddha is a name given to the historical Buddha, especially in Mahayana Buddhism. So it's nearly always the case that when someone is talking about Shakyamuni, he or she is speaking of the historical figure who was born Siddhartha Gautama but then became known as Shakyamuni only after he became the Buddha. This person, after his enlightenment, is also sometimes called Gautama Buddha. However, people also speak of Shakyamuni as a more transcendent figure who still is, and not as a historical figure who lived a long time ago. Especially if you are new to Buddhism, this may be confusing. Let's take a look at Shakyamuni Buddha and his role in Buddhism. According to legend, Siddhartha Gautama was the son of a king, and as a youth and young adult, he lived a sheltered and pampered life. In his late 20s, he was shocked to witness sickness, old age, and death for the first time, and he was filled with such dread he resolved to give up his royal birthright to seek peace of mind. After several false starts, Siddhartha Gautama eventually settled determinately into deep meditation under the famous Bodhi tree in Bodh Gaya, in North Eastern India, and realized enlightenment, at about the age of 35. From this point on he was called the Buddha, which means "one who woke up." He spent the rest of his life teaching and died at about the age of 80, achieving Nirvana. More detail about the life of the Buddha can be read in The Life of the Buddha. The name Shakyamuni is Sanskrit for "Sage of the Shakya." Siddhartha Gautama was born a prince of the Shakya or Sakya, a clan who appear to have established a city-state with a capital in Kapilavatthu, in modern-day Nepal, about 700 BCE. The Shakya were believed to have been descendants of a very ancient Vedic sage named Gautama Maharishi, from whom they took the name Gautama. There is a bit of legitimate documentation of the Shakya clan that can be found outside of Buddhist texts, so it appears the Shakya was not just an invention of Buddhist story-tellers. If indeed Siddhartha was the heir of the Shakya king, as legends suggest, his enlightenment may have played a small role in the clan's downfall. The Prince had married and had fathered a son before he left his home to seek wisdom, but the son, Rahula, eventually became his father's disciple and a celibate monk, as did many young men of the Shakya nobility, according to the Tipitaka. Early scriptures also say the Shakya and another clan, the Kosala, had long been at war. A peace agreement was sealed when the Kosala crown prince married a Shakya princess. However, the young woman sent by the Shakya to marry the prince actually was a slave, not a princess--a deception not discovered for a long time. The couple had a son, Vidudabha, who swore revenge when he learned the truth about his mother. He invaded and massacred the Shakya, then annexed Shakya territory into Kosala territory. This happened near the time of the Buddha's death. In his book, Confessions of a Buddhist Atheist Stephen Batchelor presents a plausible argument that the Buddha was poisoned because he was the most prominent surviving member of the Shakya royal family. The samghogakaya body is the body that feels the bliss of enlightenment. A Samb Hoga kaya Buddha is purified of defilement and is free of suffering, yet maintains a distinctive form. The dharmakaya body is beyond form and distinction. The three bodies actually are one body, however. 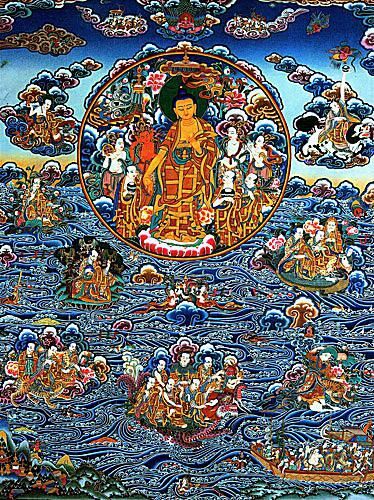 Although the name Shakyamuni usually is associated with the Nirvana kaya body only, occasionally in some schools Shakyamuni is spoken of as all bodies at once.